6. Use a wire to connect the left two holes on the bottom. 7. Repeat for the right two holes. 8. 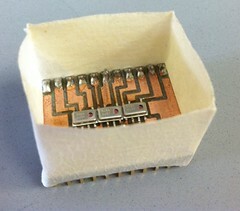 Attach pins and solder. 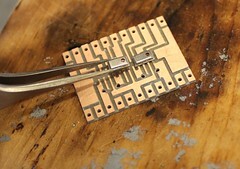 Use shears to cut the PCB into smaller piece. 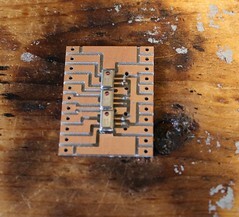 A 180mm x 60mm is sufficient to make ten boards. Use double sided tape to fixture the piece onto a mounting block. Use a 1/32” end mill for both holes and traces. Use CAMBAM to produce G-code. The file TripleArray_x10.cb is already set up with the proper settings for CAMBAM. The file TripleArray_x10_gcode.nc is the G-code for a Mach 3 CNC mill. Holes are drilled through. Traces are engraved below copperclad. Edges are engraved through. Sand down the traces to make sure the sensors lie flat. Drill out holes from the bottom using a #65 bit to make sure pins fit. Counter bore hole with larger drill bit (a #33 bit works) to make sure wires do not comes in contact with the bottom of the board. The contacts of the sensors must be placed in the appropriate location. 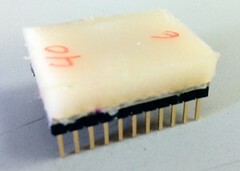 If the membrane of the sensor is to the right, then the traces with the holes should be below the sensors. Place sensor with contacts face up. 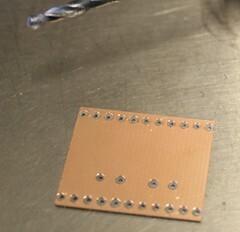 Line up contacts with holes, hold the template firmly in place with tweezers, apply liberal amount of solder. Use edge of tweezers to press the solder onto the contacts. Carefully remove the sensor from the template, making sure to keep the solder attached, and drop in the appropriate location. 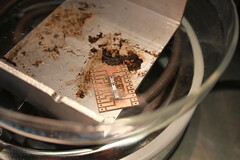 Method 2: Apply solder directly onto sensors or onto board. 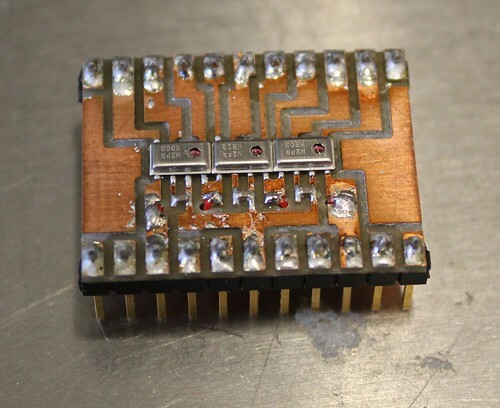 Make sure not to use too much solder to make a connection between two contacts. Carefully drop the sensor into the appropriate location. A lot of movement after placement may cause a bad connection. 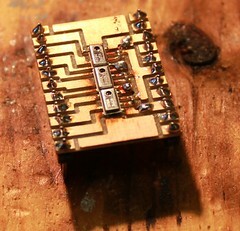 Use tweezers to place a small drop of solder on the traces shown in the picture. Make sure solder does not get into the grooves. Use tweezers to lightly place the capacitor onto the solder bridging the two sides. When the solder is heated up on the hot plate/in the oven, the capacitor will fall into place. Create mold for rubber in order to attach rubber on top. You can obtain files for the mold from Leif or Yaro. An easier way to attach the rubber is to simply tape the sides of the board with masking tape to create your own mold. Just make sure the there are no holes on the sides or corner of the tape. You can use a mold release agent on the bottom on the board in case any rubber leaks, but it isn't necessary. Mix equal parts of A and B of Vytaflex. Stir for 3 minutes, making sure it is completely mixed. Pour evenly into mold on top of sensor. N.B. : Some may leak out; just . Degass until no more bubbles appear. After degassing, top off mold. Needs 16 – 24 hours to finish rubber. **Ignore the 40 and the 6 on the rubber. They were just to mark the rubber as Shore A 40 and 6 mm height. 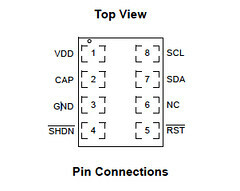 Connect the I2C to USB bridge to the computer via the USB cable provided. 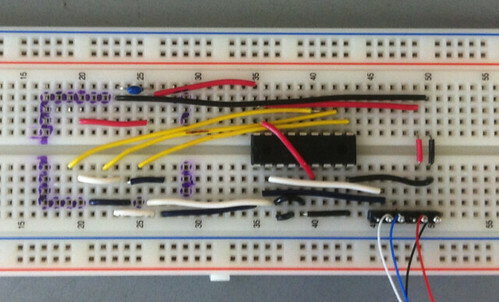 Place the sensor on the breadboard. Start up the Bridge Control program. Click the +5.0V for Power. Toggle power by hitting the button below the "Connect" button. The bottom of the screen should read "Connected" and "Powered". 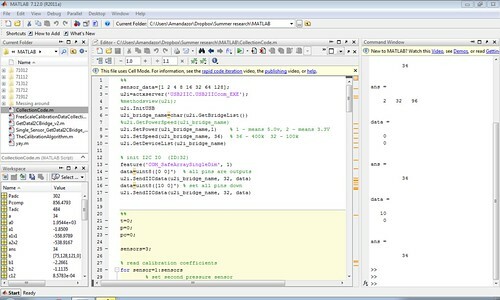 Open up "FreeScale_Triple_new.iic" or copy its contents into the editor. Make sure "Send all strings" is checked. Everything is working correctly when all signs are positive "+". If everything is working properly, hit "Repeat". When you switch to the Chart tab, you will see a graph of the raw pressure and temperature data being plotted in realtime. When finished, disconnect the bridge and close the program. Make sure the Bridge Control program is closed. 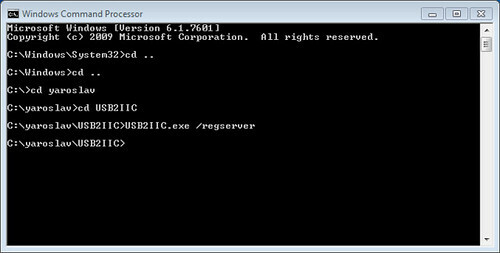 Open Windows Command Processor ("cmd") and "Run as administrator". Open CollectionCode.m. There are four parts to this file. The first cell of this file is used to make a connection to the bridge. Evaluate the first cell by hitting ctrl+enter (or cmd+return for Mac users). If the last two "ans" variables in the command window equal 34, then a connection is made. 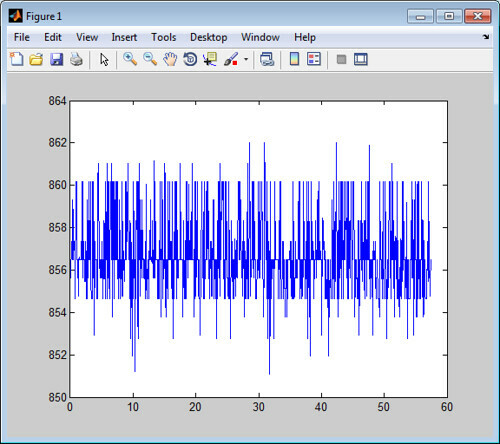 A graph appears with a realtime plot of pressure versus time. Hit ctrl+c (cmd+c for Mac users) to stop reading the sensors at any time. 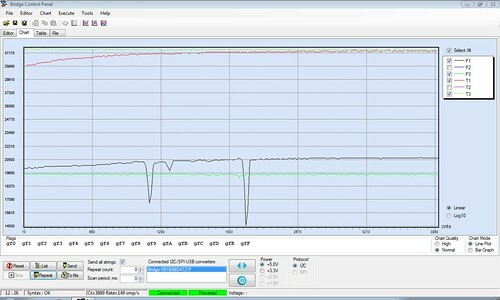 Evaluate the third cell to save plots of calibrated and uncalibrated pressure, temperature, and the workspace variables. Change names as appropriate. Finally, evaluate the fourth cell to release the bridge. Since the bridge can only maintain one connection, if you do not do this, you will not be able to use Bridge Control. Necessary files can be found at the Google Doc folder: Three Sensor Array Files. 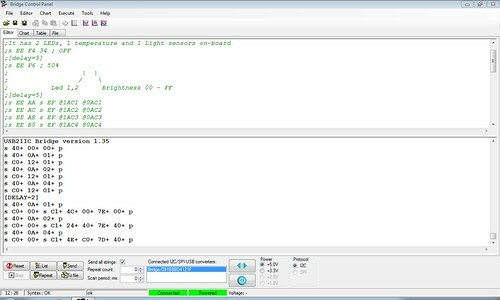 Use these files read pressure and temperature data from the sensors in MATLAB and in Cypress Bridge Control. 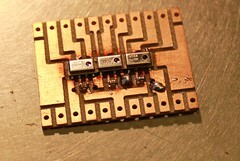 Use these files to modify the PCB layout and to mill out the boards. CAMBAM - used to create gcode from CAD files. Cypress Bridge Control - used to communicate with the sensors. 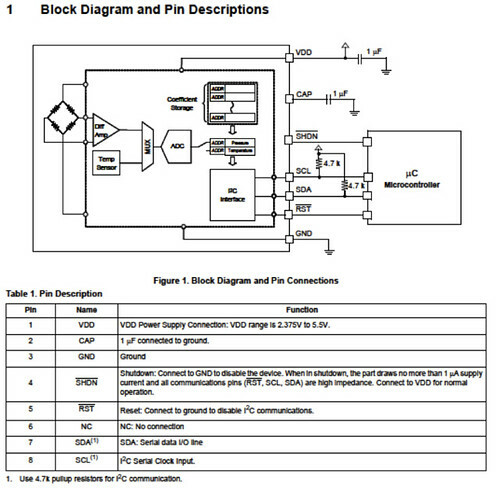 The software comes with the I2C to USB bridge.